The inspiration for this recipe comes from the America’s Test Kitchen Comfort Food Makeovers cookbook. 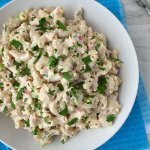 I’m a big fan of pasta and tuna salads, so I put the two together and came up with this recipe. If you’ve been reading my blog for long, then you know I love meals that include your protein and carbs all in one dish. As much as I love mayo, I decided to substitute some greek yogurt for it in this recipe because we were using a pretty good bit of dressing. The ratio is half and half. I’m not one of those people that can totally swap it out for mayo in recipes. Honestly, I need that mayo flavor to be evident. All yogurt in a recipe just doesn’t cut it. The goal in substituting was to cut a little bit of the fat, and partly to sneak a little probiotics into our diet. I used a whole milk greek yogurt from Maple Hill Creamery, which I just love. It’s 100% grass-fed, and the price on their yogurts is the best I’ve seen for that kind of quality. The mayo was store-bought, and it’s the Sir Kensington’s brand. I managed to snag one of the bigger sized jars on sale at Whole Foods a while back. As far as ingredients are concerned, it’s one of the best store-bought brands. It also tastes really good. Personally, I think that this is at its tastiest if eaten right away, but it can be made ahead. You’ll just need to stir in a little warm water to loosen it back up. I did this with the leftovers we had for lunch the next day, and it was still very delicious. 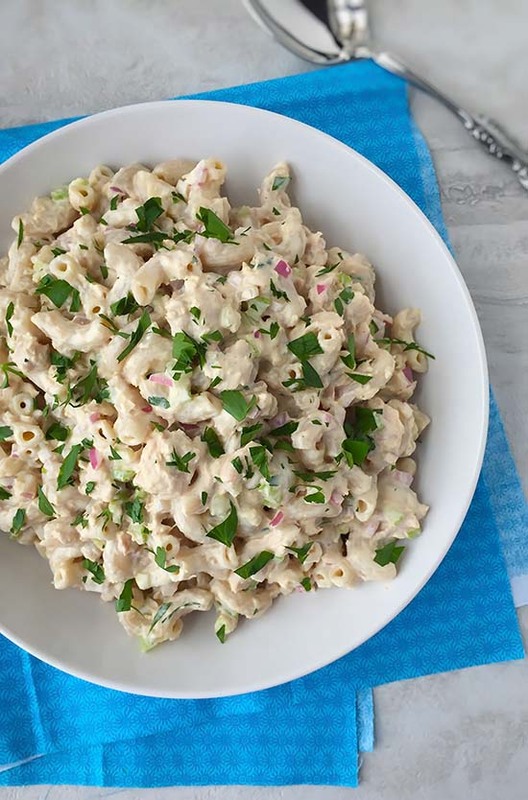 This Macaroni Tuna Salad obviously transports really well, so if you’re looking for more real food lunch recipes to take with you to work, then this fits the bill. In a large pot, bring 4 quarts of water to a boil. Add sea salt and pasta, and let cook, stirring often, until just tender. While the pasta is cooking place the drained tuna into a large bowl and flake with a fork. Drain the pasta when al dente, and rinse with cold water until it's cool, then drain shortly. You want the pasta to still be slightly wet. Place it into a large bowl. 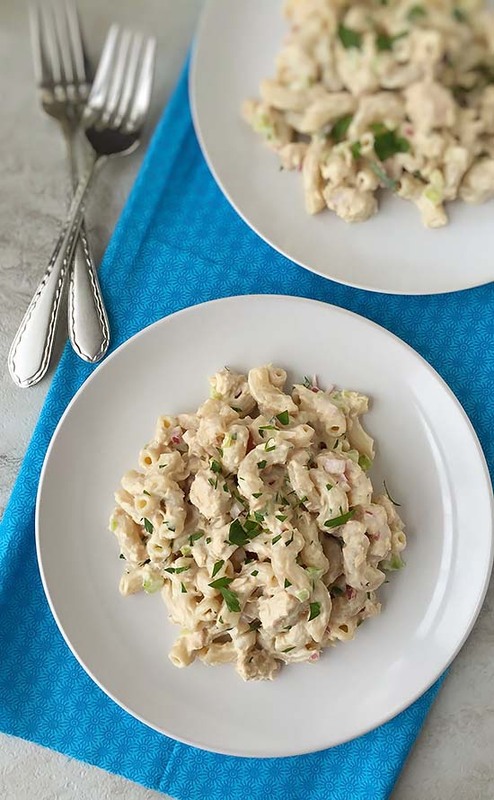 In a small bowl, mix together the mayo and yogurt, dijon mustard, onion, celery, lemon juice, parsley, garlic powder and cayenne powder, then give it a couple of minutes to absorb the flavors. Add the sauce to the pasta and tuna and gently mix to combine. Let sit until the texture of the salad is no longer watery, about 5-10 minutes. Season to taste with sea salt, then serve. The reason for leaving a little water on the pasta is so that it absorbs the water and not the dressing, resulting in it being dry. Where’s the tuna? What type is used? Oh my goodness, I can’t believe I left out the tuna! Thanks for bringing that to my attention. I’ve corrected and updated the recipe. Thanks!